Worka identifies the 6 most visible colors in each piece of content of a project and allows the author to use those exact colors for customizing the portfolio’s design. 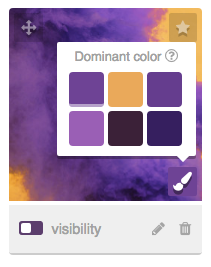 Accessing this feature is pretty easy as it is represented by a paint brush after the media is uploaded. By clicking this icon, a small window with the 6 colors will open. Once you choose your preferred color, and depending on the theme selected, it will be used for enriching your theme's design and giving an unique touch to your portfolio.